Our Newsletter this Summer is going to concentrate on a shout-out to our partners and projects in the field that have had a positive impact on efforts to protect the tiger in the wild and disrupt wildlife crime. The Wildlife Protection Society of India [WPSI], founded by Belinda Wright in 1994, is clearly the most dynamic and effective tiger conservation organization today. The Indian Express wrote: “Shockingly the forest department functions without intelligence networks of its own and has to depend on organizations like the WPSI for the secret information. In most of the seizures and arrests, invariably the WPSI provides the leads.” We have assisted the Wildlife Protection Society of India in its signature Poaching and Trade campaign since 1996 to preserve and protect tigers and shut down the wildlife crime trade. In March, I met with Nitin Desai, WPSI’s Director of Operations in Central India, who proudly reported to me that since two major wildlife crime operations, one in Maharashtra in 2013, and the other in the village of Gandai in 2015, there has not been a report of tiger poaching for trade in Central India. There have been tiger deaths, sadly due to a recent upsurge in electrocutions. Tigers have not been the targets but farmers are electrifying fences around their property and poachers are using wires to kill deer for meat. The Central India success story is largely due to the brilliant and hard-hitting work of Nitin Desai and the entire Central India team from the WPSI. A Times of India story in June of 2013 announced that in the state of Maharashtra, 2 tiger poachers belonging to a 30-member gang of the notorious Baheleyi poaching community had been arrested and were alleged to have killed 5 tigers to sell skins to a trader in N. India. In May, 2013, the WPSI with its strong network of informants, alerted local authorities and the police took action. Upon questioning, the tiger poachers confessed that their separate teams had killed 11 tigers in the past eight months. All the tiger skins were sold in April and June of 2013 to Sarju Bagdi, a tiger skin and body parts trader from the Delhi area. Then in September of 2013, the Wildlife Crime Control Bureau arrested Sarju and his accomplice, along with their Delhi-based mastermind, Surajpal. Surajpal was in possession of 18 kgs. of fresh tiger bones and $85,000 in cash. They had recently purchased five tiger skins in Central India and sold them to buyers in China, via Nepal, with the help of two Tibetan couriers. Sarju told a journalist that their gang, headed by Surajpal, were not the only traders in operation and that three other syndicates had taken 20 to 25 dead tigers from Central India between October of 2012 and May of 2013. A list of 80 wanted poachers was prepared by the authorities from information received in various tiger poaching cases across Central India. Twenty-six were arrested, 12 from direct information provided by the WPSI. In 2015, based on information gained by the WPSI during an arrest in Nagpur, it was thought that two major tiger poachers from the 2012-13 Maharashtra cases were operating out of a home in the town of Gandai, East of Bandhavgarh. The WPSI Field Officer at Bandhavgarh drove there on the motorcycle that we purchased for him to confirm this tip. After several days of surveillance and confirmations that Jhallu Pardhi and Bainram Pardhi were in the house, Central Bureau of Investigation inspectors and 50-odd personnel, including forest guards and Chattisgarh police, raided the home with guns drawn and arrested the two. “It was a well-planned surgical strike and the guys were picked up from their beds. They never knew what hit them,” wrote Nitin Desai. Jhallu and Bainram were not only killers of tigers but masterminds in the wildlife crime syndicates trading across the border to Nepal. The poachers from the 2013 Maharashtra affair are slowly getting out of jail and being closely watched. Thus far they have not returned to a life of wildlife crime. The Pardhi brothers from Gandai will likely remain in jail until 2020. The poaching gangs have been clearly rattled by these arrests and convictions. Congratulations to Nitin Desai and his WPSI team in Central India for the remarkable fact that there has been no known case of tiger poaching for international trade over the past 5-year period in Central India. There can be no better example of tiger conservation than saving the life of one. The Saga of B-2 is a story so good it bears repeating, especially for those of you new to our Fund. The Wildlife Protection Society of India did an intervention and saved the life of the dominant male tiger at Bandhavgarh, known as B-2. 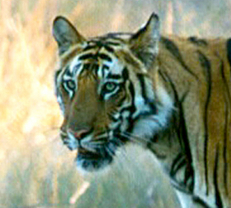 Informant networks were indicating increased poaching activity in the Bandhavgarh Tiger Reserve area. WPSI’s Director in Central India obtained a wiretap on the notorious tiger poacher named Shabbir Hussein Qureshi. Qureshi had put a price of $4000 on the skin and bones of B-2. WPSI went to the local Forest Department with the proof of a ‘hit’ that been put out on B-2 and for months increased patrols were highly publicized, especially during the full moon cycles when the poaching gangs work best. Three months later informants in the poaching gang confirmed that the ‘hit' had been called off. Largely due to the information provided by the WPSI, Qureshi was arrested in 2007 and convicted of money laundering associated with his wildlife crime profits. Under interrogation he confessed to being behind the death of 600 tigers. He was sentenced to 3 years ‘rigorous’ imprisonment and died in jail in 2009. B-2 died of old age in 2011 at the age of 14!! As good as the news is today in Central India and at Valmiki Tiger Reserve, wildlife crime does not rest. an illegal wildlife trader from Humla district of Nepal was arrested by the Central Bureau of Investigation (CBI) with 7.24 kg of tiger bones in Delhi with the assistance of WPSI on 27 May, 2018. Building on the success of the Bondomobile One van, the Tiger Conservation Awareness Program started with the WPSI at Bandhavgarh Tiger Reserve in 2011, two additional vans hit the roads to canvas the Kanha and Tadoba tiger landscapes. By the end of last year, all three Bondomobiles had amassed some impressive totals: 1813 village meetings, attended by 348,660 villagers, 3636 forest staff, 625 weekly markets, and 165,130 Secret Reward Scheme cards handed out. The Secret Reward scheme seems to one of the most effective parts of this program, wherein secure phone numbers are given and rewards offered for any actionable information about illicit wildlife crime activity. Today, thanks to the continued generosity of David Bonderman and his desire to do more, the Bondomobile fleet is expanding to seven!! Bondomobiles 4 and 5 were commissioned on June 5th after training workshops by Nitin Desai, and hit the roads for their first village meeting at Tadoba Tiger Reserve and Nagzira Tiger Reserves respectively. By the end of the year Bondomobiles 6 and 7 should be canvassing Pench Tiger Reserve and Panna Tiger Reserve. It is our hope that this fleet of tiger conservation vehicles will blanket Central India’s tiger habitat with eyes and ears to protect tigers and to disrupt and harass the poaching gangs. Each vehicle will have a WPSI Field Officer associated with it to co-ordinate activities and information with Nitin Desai. The WPSI Field Officer at Bandhavgarh, whom we began supporting in 2001, has proven invaluable in this regard. Operation Bondomobile, named in honor of the generous gentleman funding this via The American Himalayan Foundation, with its tiger-striped painted vans and audio visual equipment, has proven to be even more successful than anticipated. Apart from creating large-scale awareness of the plight of the tiger in the tiger reserve fringe villages, the Bondomobile has helped address the deeply rooted issue of corruption, while becoming a true ombudsman in airing grievances between the villagers and the Forest Department. It has become universally agreed upon that successful conservation depends upon the co-operation and participation of local communities around tiger habitat. With the vision of Dr. Bhim Gurung, and in partnership with Nepal’s National Trust for Nature Conservation, The Fund for The Tiger began funding the Community Based Anti-Poaching Unit (CBAPU) in 2009 at Dalla in the southwestern corner of Bardia National Park. This idea met with resounding success and there are now over 2500 young volunteers in 93 groups involved in tiger conservation throughout the Bardia landscape. This idea has now spread to Chitwan as well. In March of this year, I visited the CBAPU at Dalla. There was a nice gathering of about 25 young people. I took this opportunity to laud them for their dedication and remind them that they are protecting THEIR wild animals who are under threat from a market thousands of miles away. A poll of hands showed that not all understood this. And I reminded them of the successes of the CBAPU movement that has spread across the Bardia landscape and now on to Chitwan all started right here at this Dalla Post. The groups go out on patrol with the Army twice a week, 3 times a day. In Nepal, the Army is responsible for the security and protection of tiger reserves and national parks. In India, it’s the Forest Department. Last year our Dalla group routed out 3 different groups of Indian nationals moving through the forest with dogs pretending to be collecting plants for herbal medicines. Based on the success of the CBAPU at Dalla Post, Bardia, we have consolidated our efforts at Chitwan National Park and are initiating a CBAPU, based on the Dalla model, at Meghauli village. This will be co-ordinated by Dr. Bhim Gurung and run through the Nepal Tiger Trust at Meghauli. Gurung’s colleague in Kathmandu, Prakash Shrestha, submitted a proposal to Nepal’s Department of National Parks and Wildlife Conservation at the end of March and approval was granted on April 17th. Two women from the hill town of Gorkha, displaced by the earthquake, are now there receiving naturalist training. We are excited about the new effort and have made a five-year commitment..
For several years we have been funding the work of Baburam Mahato, lead camera tracker and tiger monitor, and his team, and their results have been significant, proving that Chitwan National Park and the buffer zones around Meghauli and Madi villages have a healthy tiger population. Our project is a continuation of the Smithsonian tiger-monitoring project started by Chuck McDougal in the 1970’s and now supervised by Dr. Bhim Gurung from Minnesota. Baburam traveled to Bardia to be with my group last March. His PowerPoint presentation was so impressive that Dave Griffin pledged to pay for five new camera sets/ten cameras. Since 1994, I have taken 205 people on 22 Mountain Travel Sobek tiger conservation trips to Bandhavgarh, India and Chitwan or Bardia in Nepal. At Bandhavgarh this past March, we had a very interesting set of sightings of 3 generations of tigers. We watched the ten-year old tigress known as Suki Patia lying in the bamboo forest. She is the tigress that followed closely behind one of our jeeps in 2016. Then we saw her six-year-old daughter, Spotty, lying on a river bed, getting up and walking next to our jeep before disappearing in the forest and coming out again to come through the water directly towards us. The next afternoon we watched her napping on the road for over an hour. She never did get up so we retreated in the darkness to our hotel. The last day we saw all three of Spotty’s three-year olds coming through the forest on separate paths. There has yet to emerge a dominant male tiger in the core area of Bandhavgarh like Charger, B-2 or Bamera, but the tiger population is healthy. Tiger Den naturalist Jagat and I listed 7 males, 11 breeding females, 15 cubs and 3 dispersal aged sub-adults. At Bardia, we had a most sublime sighting at a place called Tinkune. In the late afternoon sun, a large male tiger emerged from the grasslands into the water. It was surreal, like a light was turned on and he was almost glowing gold. After a while he walked over the left edge of the stream and laid town in the water. Shortly thereafter, a very small baby rhino emerged from the same riverbank followed closely by its mother. This could have gotten very interesting. Tigers will attack a small rhino but not a full grown one. In fact, there is a tiger at Chitwan who is named The Rhino Killer. The baby rhino and mother then disappeared from view as 3 more large rhinos came out of the grass to graze, drink and wallow. All under the watchful eye of the tiger. in the Golden Triangle Special Economic Zone of northern Laos. A press release from the London-based Environmental Investigative Agency [EIA] on January 31, 2018, gives hope that they may be facing some international pressure. Despite being on Laos territory, this is run as a Chinese enclave, where all business is done in Chinese currency, clocks run on Beijing time, staff are predominantly Chinese nationals and Chinese police vehicles have been observed on patrol. JAIBAGH- the email address of The Fund for The Tiger, means “long live the tiger” in the Nepali language. Please check out our website with expanded essays and photographs at: www.thefundforthetiger.org. Also please notice that we have added a DONATE button on our home page for easier contributions. •Thanks to Mountain Travel Sobek for continuing to operate the fundraising Save The Tiger trip in support of The Fund for The Tiger. The trip, which visits Bandhavgarh National Park in India and Bardia National Park in Nepal, is an excellent way for people to travel into the heart of tiger country, see a tiger in the wild, meet those working at ground zero to preserve and protect this magnificent animal, and make a significant contribution to tiger conservation work. I created this trip in 1994 and it has taken 205 people into the land of the tiger and generated over $327,000 towards tiger conservation. The next Save The Tiger trip will be March 12-March 26, 2019. Information about this trip and a detailed itinerary, can be found on the MTS website [mtsobek.com]. If you know anyone who might be interested, send them my way. •A special thank you to the American Himalayan Foundation for its generous assistance over the years and to its Director David Bonderman for funding Operation Bondomobile. •The Fund for The Tiger was incorporated in the State of California as a non-profit public charity in August, 1995. I am extremely pleased to be able to say that as of June 30, 2018, we have been able to give $1,071,185 to help tiger conservation work in India and Nepal. We are helping the right people working at ground zero, boots on the ground, to preserve and protect the wild tiger in South Asia! To those of you who have contributed to this, our heartfelt THANK YOU! If you wish to help, please send your contribution to The Fund for The Tiger at P. O. Box 2, Woodacre, California, 94973 or go to the Donate button on our website. The Fund for The Tiger is a non-profit, 501(c)(3) tax-exempt public charity registered in the State of California. Your contribution is deductible for tax purposes within the limits of the law. The Fund for The Tiger would like to thank all those listed below who have made contributions in 2017 and through June of 2018. Your support is greatly appreciated.